1. 18 Ways to Live Simple Now. I really enjoyed the ease of this article. It seems obvious when it's written down so plainly but it gave me several face-palm moments of, "I should've known this". 2. 72 Ideas to Simplify Your Life. This one takes you step by step through many aspects of life and helps you evaluate it. My mind was buzzing with things to do after reading this one. 3. How to Live Simply. 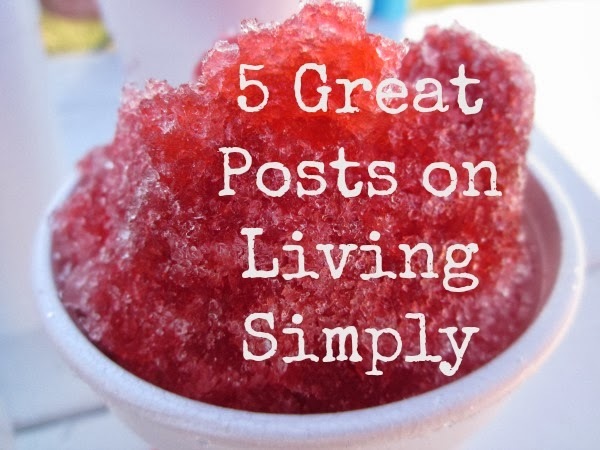 If you want a soothing, slow-paced idea of where to begin with simplifying your life, this is your post. I walked away feeling relaxed and encouraged. 4. How to Save Money and Smile More. I'm not quite ready to homestead, but these families make me want to! 5. How to Live Simply: The De-Junking Guide. I like the idea of being mindful while starting the journey of de-junking. It's good to know why we hang onto things and my reason is often the fear of "needing it someday". Are you simplifying your life, or do you want to? I'd love to know what tips you've learned along the way!